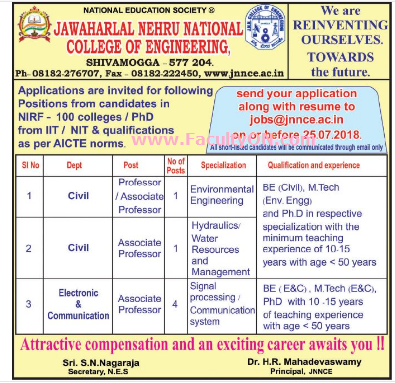 Jawaharlal Nehru National College of Engineering, Shivamogga has advertised in the DECCAN HERALD newspaper for recruitment of Teaching Faculty- Professor / Associate Professor jobs vacancies. Interested and eligible job aspirants are requested to apply on or before 25th July 2018. Check out further more details below. About College: The history of JNN College of Engineering is marked by events that have made it synonymous with quality education. Established in 1980 by NES, the College is affiliated to Visvesvaraya Technological University, Belagavi and is recognized by the All India Council for Technical Education (AICTE) and Government of Karnataka, being re-accredited by National Board of Accreditation (NBA) and accredited by Institution of Engineers (India). Set in a lush green environment of over fifty acres the college has every infrastructural facility that more than adequately, meets the requirements of around 3800 students and 400 staff members. How to Apply: Interested and eligible candidates are requested to send application along with CV, copies of certificates, PAN card, Aadhaar card and recent passport size photo to the email address given below. Shortlisted candidates will be communicated through email only.